When Fergus Reith agrees to act as tour guide for the famed palaeontologist Dr Aristide Marot, little does he realise that the search for the elusive Ozymandias will uncover spectacular riches, ruthless adversaries - and his former wife, the seductive Dr. Alicia Dyckman! Caught in a bloody civil was, the three adventurers must fight or face death by boiling in the Cauldron of Repentance! The secrets of the planet Krishna continue to unfold in L. Sprague de Camp's latest tale of mystery, treachery and romance. 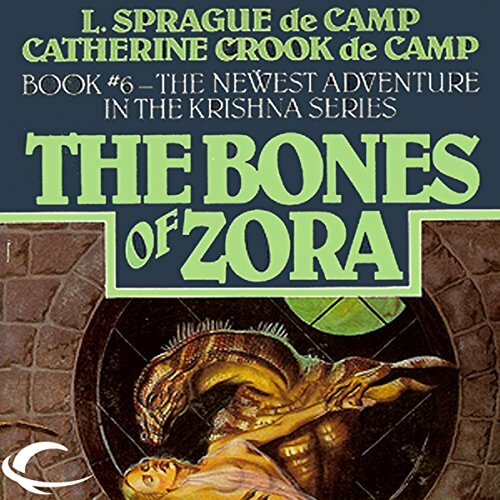 The Bones of Zora is the sixth of L. Sprague de Camp's Krishna books - interplanetary romance in the tradition of Edgar Rice Burroughs' Martian Tales. ©1983 L. Sprague de Camp & Catherine Crook de Camp (P)2013 Audible, Inc.